Baking bread for the first time has certainly sparked, within me, anew kind of passion for baking. Visiting Amy’s Bread at the Chelsea Market a couple of times has definitely helped as well. Watching professionals form buns, twists and loaves may just be my new favorite pastime. Their efficiency is impeccable. Though Chelsea Market always smells of sweet cupcakes and brownies, I can’t help but avoid them all and head straight to the bread shop. If I lose my sweet tooth, will I need to change the blog name? Whatever, it’s all sweet inspiration right? And, I have yet to even loosen my sweet tooth. In fact, I learned all about sweeteners today in class, so I’ll be back to baking treats soon. Only now that I have reliable information, I’ll be working with healthier alternatives. For now, back to sandwich breads. Kneading bread is a total hands on art form. I don’t bother with a mixer. For me, it’s more enjoyable and therapeutic to form the dough with my bare hands, to feel it’s weight and texture change and smell the yeast. No worries if you don’t knead, when the recipe calls for kneading “until smooth and elastic,” use a standing mixer to work the dough for about 10 minutes until the texture forms. This recipe originally comes from Mother Earth News. I made a few alterations; simply adding more whole wheat flour in place of all-purpose. The buns overall are firm, but light and slightly sweet. In the future, I will halve the sugar. Decide what’s best for you and go for it. It’s quite satisfying to eat a homemade burger with a homemade bun. That’s so (from) scratch! 2: In a separate bowl, mix water and yeast. Work into the rest of the batter. Slowly mix in remaining flours, sugar and salt. 3: On a clean and lightly floured surface, knead dough until smooth and elastic. Roll into a ball. Lightly oil outside of the dough, place back in the bowl and cover. Allow for 1 hour to rise in a warm location. 4: Preheat oven to 375°F. Prepare baking sheet with parchment paper or lightly oil the bottom. 5: Cut dough into 6 equal parts, then roll each part into a round bun. Place on the baking sheet, but allow about 5-10 minutes before baking. Dough will become slightly puffier. Bake for 15-20 minutes, until golden brown. One of the senior classes at my school made Mango and Mint Sorbet. I didn’t get to try any, but all the talk had me craving a bowl. Turns out the stars were alined just right, because I took home a little extra mint from my own class and mangoes were on super-sale at the market! Sometimes life is just on-point. 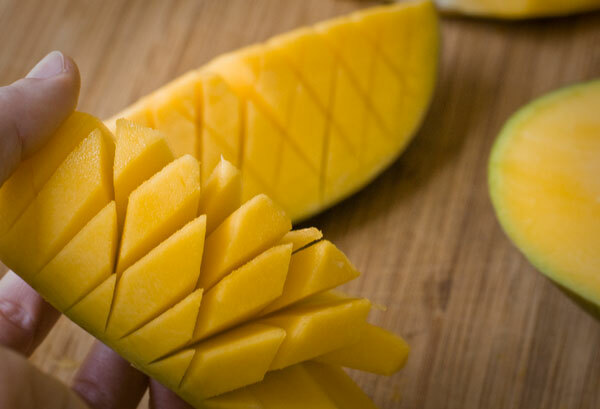 The easiest and safest way to cut a mango is when the skin is still attached. Skinning a mango first will result in loss of juices from the fruit and possibly a slippery, dangerous mess. Place the mango on the cutting board so that the stem faces you. Use a large knife to cut as close to the pit as possible (between 1/2 and 1/3 into the fruit). There should be two clean (sort of half) pieces and one with the complete pit. You may quarter the mango or leave in two large pieces. Carefully score a cross pattern through the flesh of the fruit. To score is simply to make shallow cuts, so be sure not to go through the skin. Otherwise, you may end up with a bunch of bite-sized mango pieces with the tough skin on one side. Speaking from experience, that result is no fun. This is called the Hedgehog Cut. My cut is a little abstract and less of a formal cube, but you get the idea. My initial cut was too diagonal. To make cubes, score straight with no slant in the pattern. Push the skin inside out with one hand, then with a paring knife cut the pieces away from the skin. Any large chunks may be cut, so that each piece is roughly the same size. It’s not necessary, except for appearance. If you are puréeing mango into a smoothie or sorbet, save yourself some time and effort. Begin with the first step of cutting the mango away from the pit, then score the fruit lengthwise. Use a regular silverware spoon to scoop out the fruit slices. If there is still plenty of fruit around the pit, use a paring knife to carefully trim edible pieces. All of the odd cuts are perfect for purées or a quick snack while you’re hard at work in the kitchen! 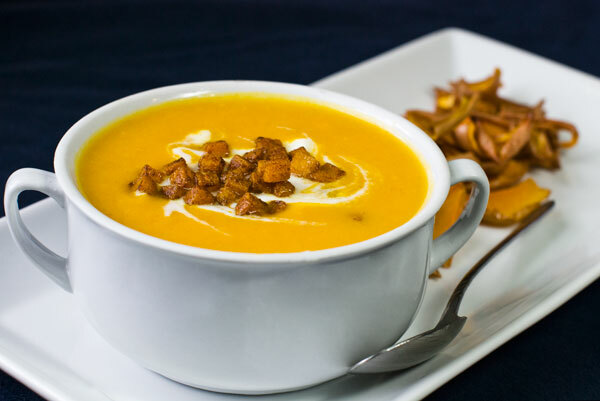 Butternut squash is a welcomed friend in our home. When I first see it at farmers’ markets I know that is usually a sign that cool weather is approaching, but for some reason I don’t care. This squash always puts a smile on my face. It’s quite versatile, as it can easily be stewed, puréed into soup, mashed, roasted or even turned into pie filling. Also, because of their durable outer skin, they store well past their season in a cool, dry environment. Seriously, how magical is this squash? Either way, I can’t go without toasting the peeled outer layer and munching on it like chips as an appetizer. Even peeled very thin, the skins aren’t usually all-the-way crisp, but have a firm, but slightly chewy bite. I usually enjoy them unsalted, but season any way you like. You be the judge and let me know what you think. Updated Note: Only make squash chips if using a squash directly purchased or given from a gardener. Store bought squashes are generally coated with a wax that may cause digestive issues. 1: In a large pot, heat squash with oil and a pinch or two of salt on low heat. Cook until squash begins to soften. Stir frequently to keep squash from browning. Add garlic (and leek). Cook until garlic becomes aromatic (and leek softens). Add turmeric and clove and continue to heat 1-2 minutes more. Add broth and bring to boil. Reduce heat and simmer about 30 minutes. 2: Remove from heat. Add coconut milk and salt and pepper to taste. Use an immersion blender (or carefully transfer to an upright blender) to purée or liquify squash mixture. If using an upright blender, remember to cover the lid with a dishtowel to prevent the hot liquid from escaping. Serve hot or cooled. 1: Preheat oven to 350°F. Prepare baking sheet with silicone mat or parchment paper. Whether they’re jazzing up a sandwich, delivered as a side or presented as the house salad, coleslaw is one of my favorite dishes. Due to enormous appreciation, I am not shy to trying coleslaw raw, tossed with vinaigrette or smothered in a mayonnaise or ketchup concoction. Yes, the North Carolina slaw is combined with ketchup and spices for a little alternative kick in the face. Honestly, the best slaws ever eaten are made by friends and family. Today’s recipe will not burn your taste buds, but excite them. I tried out this coleslaw at an Easter gathering. This is a smothered (preferred) version full of sweet and tangy flavor and crunchy texture. Something simple, but beautiful to make tomorrow for a Mother’s Day luncheon! 1: In a small, deep bowl, whisk together oil, vinegar, mustard and honey. Season with salt and pepper. Set aside. 2: In a large bowl, toss together cabbage and carrots. Drizzle dressing over vegetables, then toss. Refrigerate 1 hour or overnight. 3: Toss slaw with parsley, cranberries and walnuts before serving. Finally, weather is lovely in New York! Trees and shrubs are in full bloom with a delicate rainbow of pastels and I can finally see green grass sprouting in the former muddy sloshes. I believe this calls for a picnic! Nothing says picnic like barbecue seitan sandwiches. Seitan is an all natural “wheat meat.” A food that is made of wheat gluten, the protein from whole wheat flour. Combined with seasonings and some liquid, seitan is boiled, then ready for consumption. Although you can go further with the cooking and fry it, add it to stew, barbecue it etc. The texture can be chewy or tough, depending on how it is cooked after the boiling process. And by tough, I mean, you may need a steak knife for this vegan dish! Sound complicated to make? Well, it’s absolutely not! There are actually two ways to start making seitan. You can make your own wheat gluten from scratch by separating the starch from the protein of whole wheat flour. Separation is done by kneading and rinsing dough under running water. This process can be time-consuming and a little messy, but there are plenty of good “how-to” videos online. If you go through this process, you’re a champ! The second option is simply to purchase vital wheat gluten from the market. Brands may vary in price, but I purchased a 22 oz bag (5 cups) of Bob’s Red Mill at the regular local grocery for less than $7. Seasoning seitan can be done almost anyway your heart desires. Go wild. My friend Patrick helped get me addicted to nutritional yeast, so for me it’s a vital seasoning. If you’ve never used nutritional yeast, go for it! It’s not the yeast used to make breads rise. In fact, it’s inactive, but primarily used as a seasoning because of it’s nutty, cheese-like flavor. Beware that making seitan will cause your whole house to smell like gravy/brothy goodness. Neighbors may inquire. 1: In a large bowl, mix gluten flour with nutritional yeast and marjoram. 2: In a medium or large bowl, stir together 1 cup broth, soy sauce and 1/4 cup water. Slowly stir the broth together with the gluten mixture. Once the mixture thickens, use your hands to knead into a dough that is tough and elastic, but not too sticky, about 2 minutes. Form into a loaf and set aside. 3: Meanwhile add remaining ingredients (below the line) to a large cooking pot. Heat on the stove at medium-high. 6: Use a draining spoon to remove seitan. Set broth aside for another recipe (ie gravy, stew etc). Seitan is now ready to be sautéed, fried, baked, added to stew or made into a sandwich. 1: Heat 2 teaspoons-1 Tablespoon olive oil in a medium sauté pan. Sauté 4-6 large seitan slices until browned on both sides. Smear both sides of seitan with your favorite barbecue sauce. Cook on both sides about 30 seconds, then remove from heat. Add to a bun with your favorite toppings. Enjoy!